Many organizations today are familiar with crowdfunding or events as their main methods of individual fundraising. And while these resources are very helpful, particularly for small companies and individual artists, it’s important to build a strong, long-lasting donor program that honors those individual gifts, develops relationships over time, and grows with your organization. 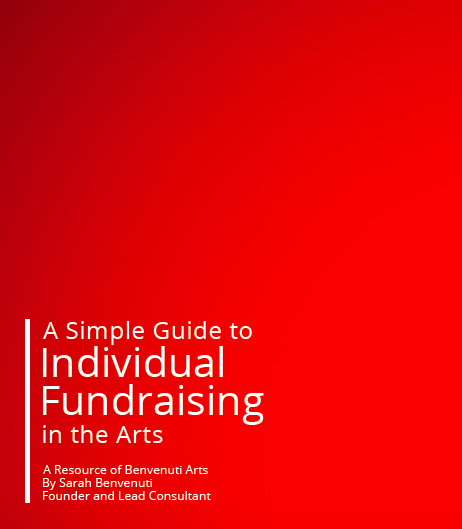 This slim, 12-page guide helps you to plan for a full year of individual fundraising, including a traditional campaign, cultivation opportunities, special events, and yes, perhaps even a crowdfunding campaign! It focuses on building a larger, ongoing donor program that can help you reach your goals, find seed funding for projects and new programs, and create a community of supporters who not only donate to your work, but are also passionate and invested, helping to broaden your community and impact over time. We strive to simplify the steps, helping even the smallest organizations build a robust relationship with donors that truly works within the limitations of their small and mighty staff.